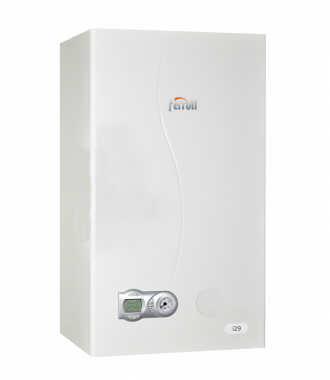 The iBoiler 29kW is a highly reliable condensing Combi unit is available as a natural gas boiler or LPG boiler. Designed and manufactured by Ferroli, the iBoiler has an efficiency of 86% and has and ErP A rating for heating and hot water. With a 29 kW output rating, this unit is perfectly suited to larger homes with more than 1 bathroom that have a higher demand for heating and hot water. The iBoiler range also includes a 25kW boiler if your demands are slightly less than required for the 29kW. Within this compact unit are a host of features and benefits from easy installation and maintenance, which will help you to save time and money to high efficiency that will help you lower your energy bills. The unit features the choice of a digital or mechanical timer, optional wireless remote thermostat, a high efficiency pump, a user-friendly control with backlit display and push button control to allow for easy adjustment of the central heating flow temperature and hot water temperature. As this is a Combi boiler, it supplies heating and hot water on demand by using the mains water supply. This means that you don’t need to have any tanks or cylinders (as you would with a Regular or System boiler) which is perfect for smaller homes where space is limited. Available with a 2 year warranty, you’ll have the peace of mind that this unit won’t be letting you down.